He is an American R&B singer who has won five Grammy Awards, runs his own label and company and is one of the most influential musicians in the world. What would you ask Usher? Usher got his start in the music business when he appeared on the US talent show “Star Search” when he was 13 years old. His performance on the show eventually earned him a contract with LaFace Records. Usher's first Grammy nomination was for best male R&B vocal performance for "You Make Me Wanna". In 2002, Usher won his first Grammy award for "U Remind Me" and the year after Usher won the same award for his song "U Don't have to Call". Usher is only the third artist to have achieved this double win, alongside Luther Vandross and Stevie Wonder. In March 2010, Usher released his sixth studio album "Raymond v. Raymond." In addition to his musical work, Usher has an extensive base of philanthropic work as well. Usher founded "New Look" which is a charitable organization which focuses on "providing young people with a new look on life through education and real-world experiences". Usher is also joining President Bill Clinton as a panelist at the third Clinton Global Initiative University (CGI U) meeting at the University of Miami in Coral Gables, Fl. Usher will be at President Clinton’s CGI U event on behalf of Usher’s New Look, which empowers young people to become global and corporate leaders. Usher and President Clinton previously partnered at the Clinton Global Initiative event in September 2009 to launch Powered By Service, a call to action through Usher’s New Look to provide $500 grants to support youth led service initiatives. 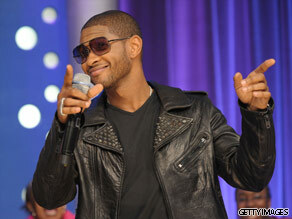 Here's your chance to send in your questions and comments to Usher. . Please leave your comments below and remember to tell us where you're writing from. –	What does your latest album title Raymond v. Raymond really means? –	What has triggered you to create your latest album Raymond v. Raymond? –	What are you going to do to make sure that the Cleveland Cavaliers will win the National Basketball Association Championship in 2010? –	What kind of relationship do you have with teen singer Justin Bieber? I am awaiting Usher Raymond’s replies. usher! !what made u believe that justin bieber would be a success the first time you saw him?what is your favourite song and artist at the moment! What inspired you to do the New Look Camp? USHER IM UR BIGGEST FAN EVER PLZ TELL ME WAT WILL HAPPEN TO UR GUD UNREALESED MUSIC SONGS LIKE OFF YOUR CHEST,LAST TO KNOW,HUSH AND OTHERS AND WHEN WILL THE DELUXE EDITION FOR RAYMOND VS RAYMOND CME OUT? My Questions For Usher Are. 1) When Are You Coming Back To NYC To Preform Or Where Is Your Next Live Preformance Going to Be Held? 2)Can You Please Follow Me On Twiiter? 3) Are You Going to Broadcast Any More Contest For Fans To Get Up Close With You? 4) What Was Your Insperation For The Album Raymond v Raymond? 5) What Is Your Favorite Brand Name Car that You Like To Drive When You Get the Chance Too? 6) Who Will Be the Next Artist You Work with? 7)When Your Home With the Boys Whats The One Game You Enjoy Playing With Them? I have this question for a Mr. Usher Raymond IV. When do you find it will be socially acceptable for you to personally establish to your musical and global audience the true nature of your immediate family and all of your young children? Please understand I am not in any light speaking of the highly published commercialized family representation of Tameka Glover. It is personal knowledge to many that you in fact are in high fear of a child whom you sand about in 2004; claiming to your musical audience and global observers it was a depiction from someone else’s affairs. Yet in still you have been constantly and consecutively known to sing about YOUR SELF?. Again, I ask you, when will you take apart this self- created this character and tell the world who you truly are and who you have truly been denying. It would be a shame for this beautiful illusion you call a career, a illusion that you and your billion dollar label have created, to come to a crumbling halt; all in light of the item you fear. Even worst the global perception that you are in fact as innocent as you try to display yourself as. How funny it comes to light, that you named your 2004” Confessions” album world tour “THE TRUTH TOUR”- Yet have not begun to – tell the truth. Hey Usher!! When are you coming to perform in France? I hope I'll get to see you soon!!! Hey usher!! You have been my favourite artist in our era,what are your plans for a visit in Africa especially my home country Sierra Leone. i believe you are reaally doing a good work in the entertainment industry. but if i may from you, what does Usher have the world since the greatest icon of the world 'Michael Jacckson' is no more. we need his skill of dancig,vocal and solo. are you ready to give us that or more better than that. Hello Usher. I am a big fan of yours from Nigeria and residing in Russia. Like everyone else here asking the meaning of your new album Raymond Vs. Raymond, I would you to throw more light on it. Also I noticed there has a lot of what people call "T-Paining" in your songs of recent. Does it mean that you are deviating from the good music that we used to get from you. Though some of songs in the new album does not impress some people but I still listen to your songs everyday to be good mood – Trading places, What a man to do, Love in the club remix with Lil'Wayne and many more. Finally, what are your plans in the future to bring a revolution to the world of R&B. Be assured I am your fan for life!!! Hi usher, i'll like to know what you do to relax, considering your busy schedule. Thks. Usher pleas can you sing with P.square from nigeria because you peaple are the same, life style voice in short everything. Usher ft psquare oh my GOD it will be nice. hope it gonno hit d ground like an earthquike? Hello Usher. Mabuhay from the Philippines. Usher I would like to ask who are you picking to win in this Season of American Idol? I watched the Episode where you mentored the Idol Contestants. My questions for usher ar (1) wen will u come to perform live in nigeria (2) i would like to say i love u,to my deary usher (3) wen is ur new realease Raymond v Raymond splashing into air,cant wait to listen to it (4) ar u married?if yes hw many kids. I love all those who care for children and their future. i appreciate the way you have provided your support to Justin BIEBER. Please tell me how you have concretely supported him. What are you planning to do in order to help him have a successful career like you? Hi mr. Usher i have just a few question for you. 1.How has the death of the legendary king of pop michael jackson affected your life and music career. 2. Am wondering why you aint doing any song with Akon? the both of you will just do perfectly. I'm very proud of you Usher Raymond for what you have done by impacting into the life of the youth in area of education that's a good legacy. You can still do more , keep doing the right thing at the right time. Hi usher,am jadman from Nigeria.i was told you had a record label of your own.tell me can you sign someone that is not from your country? (2)what inspired you to sing confession?while i waited for your answer.my regards to you. Usher i love u and i love your music. my question is, what inspired you to release the album Raymond vs Raymond? when do you intend to visit Africa(Nigeria). we really need you here. I'm very proud of you Usher Raymond for what you have done by impacting into the life of the youth in area of education that's a good legacy. You can still do more , keep doing the right thing at the right time. From Africa, Nigeria. This hendrick in south africa. usher what keeps u going! are u da next mj? Hey Usher. Keep on supporting d young once. We're supporting u USHER RAYMOND we really excited wiz ur music and ur appearance. thnx miss u. Something freaks me about u, usher and i have been wanting to ask.... were and how does ur inspiration come? how far is usher's relationship with chilli? are the married or to be marry. I luv u guy! Keep up de good work.Thumbs up man!!! Hey!!! ushe hw ar u doin i luv ur song hey daddy,wat a man can do, yeah,movin mountin etc i luv u ushe u ar bst 2 me i am also a dancer in nigerian en my crew name is da elevators we ar d bst en we all luv u usher . Hello Usher!Aileen Reyes here from Manila,Philippines.Let me first congratulate you for a very succesful Manila concert.It was such a huge hit.My question is,with the untimely death of your good friend,the King of Pop Michael Jackson,how did that change your outlook in life,as a person and as a music superstar? Thanks and more power! Its so nice to get in touch with you Usher. But the most important thing you can do for me is to consider doing a charity show in Zimbabwe, koBulawayo. Usher u're xtremely good at ur work & i really lyk u.I really wish u can bcom a muslim so dt u can enter paradise wit us. Man,we need yours in zimbabwe as well. Do you have any special talents we don't know other than singing ,acting and dancing ? Question for Usher: Why is that you like to date ladies older than you? Mr Raymond,when next will you visit and perform in nigeria? Usher, when are u release new movie? I'm expecting d best 4rm u. guy i just like d way smile. Hell usher.my qeustions ar,1) whn wil u com 2 afrika,9ja precicely 2 peform nd hlp youths explore their talent as u do there?2)hw do u thnk wil tak Late king of pop MJ,s place.nd i luv dat song OMG, it 1 of da best of ur song dat i ever had,cause u dance a bit of 9ja dance cal(alanta)9ja4luv.